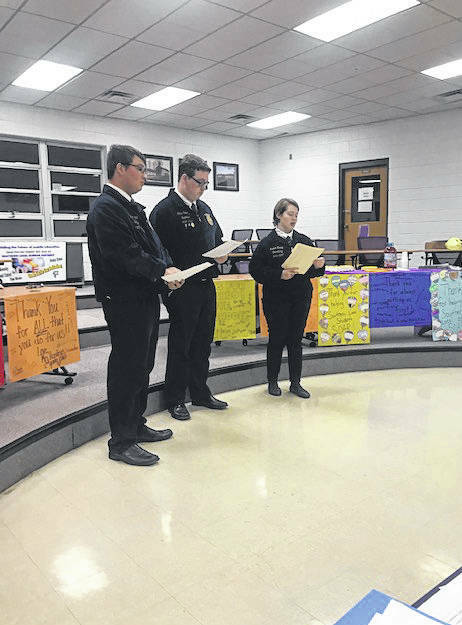 Southern FFA Officers made a presentation at Monday’s board meeting. STORM Students of the Month recognized at Monday’s board meeting were Vince Parry and Ally Anderson. RACINE — The Southern Local Board of Education conducted its first regular meeting of 2019 on Monday evening in the Kathryn Hart Community Center. Among the items approved by the board was a Resolution to Support Military Children and Families. WHEREAS, the Southern Local Board of Education calls for the continued creation of opportunities for military families and community members in supporting student achievement, aspirations and social-emotional development. FURTHER RESOLVED: That the Southern Local Board of Education encourages all school staff and community members to initiate, support and participate in appreciation activities designed to recognize the exceptional role and unique sacrifices our military-connected families make in our nation’s best interest. In addition, veterans will be admitted free into the Southern boys basketball game in Jan. 18. 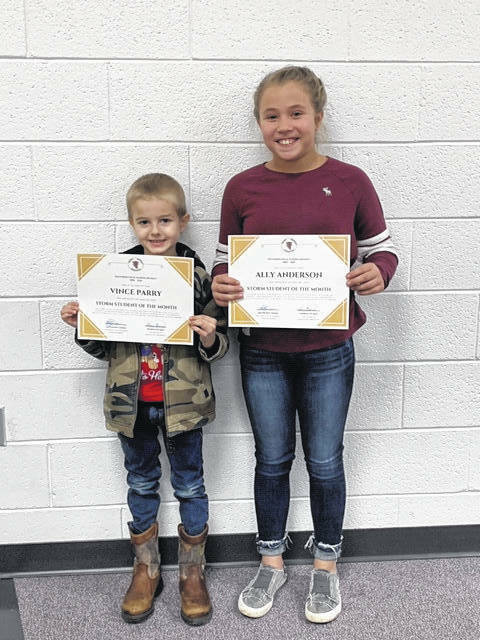 As part of the educational report, STORM Students of the Month Vince Parry (Kindergarten) and Ally Anderson (6th grade) were recognized. The board also heard from the Southern FFA Officers. In personnel matters, the board accepted the resignation of bus driver Wendell Ervin, effective Jan. 1, 2019, for retirement purposes. Additional hours were approved for third grade teachers for reading tutoring for the third grade reading guarantee. Supplemental contracts for the 2018-19 school year were approved as follows: Kyle Wickline, head baseball coach; Keith Carroll, assistant baseball coach; Audra Wilkinson, pep band; Jordan Huddleston, assistant softball – JV; Tim Thoren, preschool EMIS; Brian Weaver, assistant softball; Daniel Buckley, junior high track; Amanda Rinaldi, assistant junior high track; Nick Stevens, assistant baseball (half); and Jason Stewart, assistant baseball (half). Dock days were approved for three employees. Approved the minutes, bills, financial statement, bank reconciliation statement and all checks for the month of December. Revised permanent appropriations were approved in the amount of $12,498,996.63. Approved a donation in the amount of $250 from The Wal-Mart Foundation to the Class of 2020 for their volunteer service. Approved a transfer of $37.51 from the Class of 2018 fund to the Student Council fund. Approved the second reading of revised board policies on conflict of interest and college credit plus. The next meeting of the Southern Local Board of Education will be held at 6:30 p.m. on Monday, Feb. 25, in the Kathryn Hart Community Center.